Ariana created this CD make the good medicine of singing accessible to everybody. Anyone can sing along to this full album of luscious vocal practices regardless of experience or expertise. 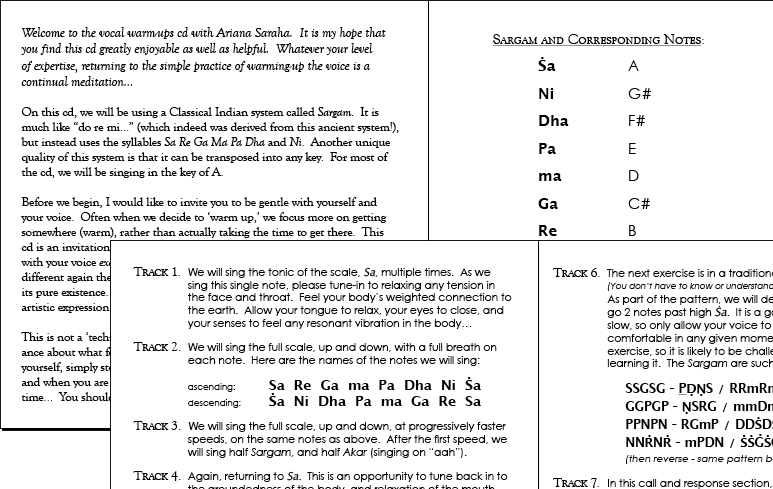 Includes exercises and instrumentation from Indian Classical singing, as well as a call & response improvisation, full instruction booklet, and a previously unreleased song (“How can I keep from Singing”). The album download includes an 8-page PDF instruction booklet for those who wish to learn the practices with precision, and because the album itself is purely musical (no spoken instruction), it also makes for beautiful background music for yoga, meditation, or massage. © All tracks copyright Ariana Saraha, except #9 - traditional.